Have you seen Laurie's (a.k.a Crazy Aunt Purl) request for pictures of our 'knitting spots'? I liked the idea, and this picture, so much that I decided to post the picture of my favorite knitting spot here. 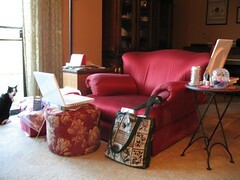 I love my big red chair. It started life 20 years or so ago, as a blue floral velvet chair with lots of wood trim. It had a matching couch and they lived in my mother's living room. When Mom got new furniture, it went to live with my sister, and eventually ended up in my living room. It was the most comfortable chair ever, but I hated the upholstery (sorry, Mom!) and draped various things over it to try to disguise the blue floralness of it. A few years ago, I had it (and the footstool, which was blue 'leatherette') recovered. The upholsterer was a true artist. He totally reshaped the chair. Can you even tell that there used to be wood trim on the arms and back? I could have bought a new chair for what I paid, but I couldn't have gotten anything as comfortable or with such perfect red-on-red stripes. Harley says, "No, I won't show your scary knitting friends how I sit on the back of the big red chair."